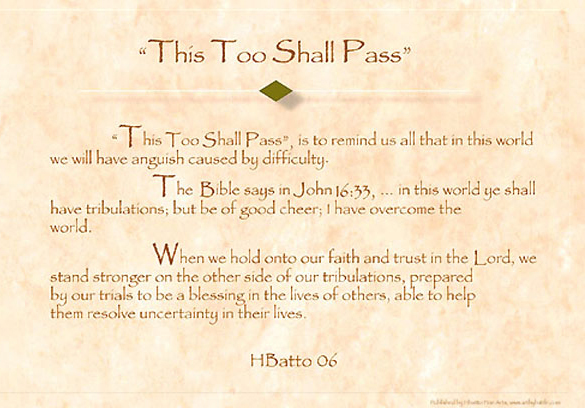 “This Too Shall Pass”, is to remind us all that in this world we will have anguish caused by difficulty. The Bible says in John 16:33, … in this world ye shall have tribulations; but be of good cheer; I have overcome the world. When we hold onto our faith and trust in the Lord, we stand stronger on the other side of our tribulations, prepared by our trials to be a blessing in the lives of others, able to help them resolve uncertainty in their lives. Categories: Message Prints, This Too Shall Pass. Tags: Message Print, This Too Shall Pass.